Hopefully, you are already in full swing on your own garden, but if you have been putting it off, or are still conducting research on how to start your own garden, this article is for you. If you’re a beginner vegetable gardener, here are basics on vegetable garden planning: site selection, plot size, which vegetables to grow, and other gardening tips. Do you have enough sun exposure? Vegetables love the sun. They need at least 6 hours of full sun every day, and preferably 8. Know your soil. Most soil can be enriched with compost and be fine for planting, but some soil needs more help. Vegetables must have good, loamy, well-drained soil. Check with your local nursery or local cooperative extension office about free soil test kits so that you can assess your soil type. See our article on preparing soil for planting. Placement is everything. Avoid planting too near a tree, which will steal nutrients and shade the garden. In addition, a garden too close to the house will help to discourage wild animals from nibbling away your potential harvest. Decide between tilling and a raised bed. If you have poor soil or a bad back, a raised bed built with nonpressure-treated wood offers many benefits. Vegetables need lots of water, at least 1 inch of water a week. See more about when to water vegetables. You’ll need some basic planting tools. These are the essentials: spade, garden fork, soaking hose, hoe, hand weeder, and wheelbarrow (or bucket) for moving around mulch or soil. It’s worth paying a bit extra for quality tools. Study those seed catalogs and order early. Check your frost dates. Find first and last frost dates in your area and be alert to your local conditions. 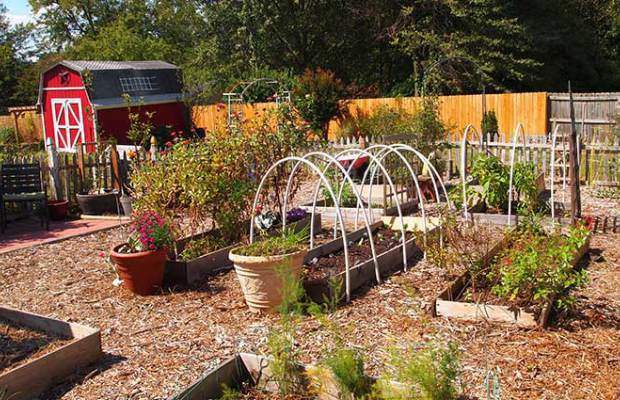 A good-size beginner vegetable garden is about 16×10 feet and features crops that are easy to grow. A plot this size, planted as suggested below, can feed a family of four for one summer, with a little extra for canning and freezing (or giving away). The vegetables suggested below are common, productive plants but you’ll also want to contract your local cooperative extension to determine what plants grow best in your local area. Think about what you like to eat as well as what’s difficult to find in a grocery store or farmers’ market. If you are planting seeds, consult our Best Planting Dates for Seeds chart. It’s customized to your frost dates as well as Moon-favorable dates. If you’re putting plants in the ground from a nursery or transplanting from a greenhouse, see our Best Planting Dates for Transplants (by region). Now Design Your Best Garden Ever! 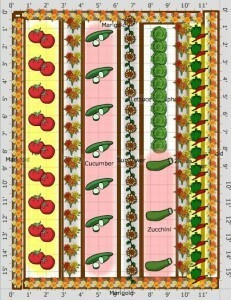 Plan your perfect vegetable garden. Use our online Garden Planner to draw out your vegetable beds. The best way to plan a successful veggie garden is to look at what similar gardeners have planned and see what works for them.